You need to carry more than would be advisable on two wheels: 4 or 5 kids, loads of bricks or milk or cheese, an ice-cream freezer etc. 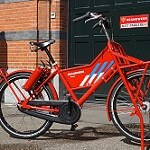 The bike will mostly stand stationary anyway, such as with a vending bike. One of more of the people who’ll ride the bike aren’t competent cyclists. This can be because they didn’t grow up riding bikes (a foreign au pair) or a function of a balance problem or disability. You’ll often ride with heavy or precious loads on snowy or icy roads. Trikes are easier to handle in slippery conditions. You just happen to like trikes. Who am I to argue? In any case I put this picture up because it demonstrates a problem with some trikes: They can tip onto their noses when the center of gravity moves too far forward of the front axle. Usually this happens while kids are climbing into the trikes from the front. On the Nihola its funny to see but really not a problem: Unlike most trikes the Nihola’s front wheels steer independently, as on a car. The frame is thus a single unit so the tail simply sticks in the air and the kids laugh. 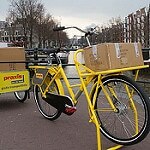 However the Nihola is not the only child carrier trike with the front wheels well behind the front of the box. 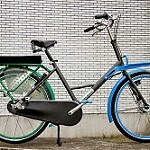 The Winther Kangaroo, TrioBike and Zigo Leader are also constructed this way. I’ve never seen a Zigo but it appears, like the Nihola, to have independent steering via tie-rods. Reports from my colleagues that the Zigo’s turning circle is very large would tend to confirm this. The Zigo’s child carrying unit sits almost entirely forward of the front axle and the bike is very light so it will almost definitely tip forward when kids climb in the (only) front entrance, unless mom is attendant and holding the rear end down. Fortunately, like the Nihola, the Zigo’s tail will merely stick way up into the air. Annoying but probably not dangerous. 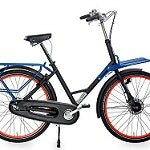 When this happens to the Winther and TrioBike its not such a humorous occurrence: These trikes have central, axle pivot steering, meaning that the trike steers by turning the front carrier parts of the trike in relation to the rear bicycle part. 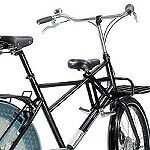 Thus when the nose goes down and the tail goes up… the rear part of the bicycle will rapidly fall to one side, perhaps tipping the entire bicycle, falling into a parked car or other bicycles, or even falling into the roadway. Both of these bikes have light aluminium frames so it really doesn’t take so much weight to tip them. One can argue that a parent should always be present to hold the bike steady but that’s just not how it works in the real world: kids absolutely love playing on and in these bikes, regardless of adult supervision. The photo of the Nihola I found in the flickr album of “andjohan”. 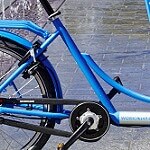 For more reading material about the TrioBike have a look at this earlier post where I used it as an example to complain about how ridiculous and inaccurate online “reviews” can be. The comments that follow get rather bizarrely heated and emotional. 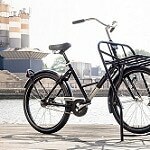 This entry was posted on Sunday, May 18th, 2008 at 23:35	and is filed under Cargo trikes / Bakfietsen, Child and family transport, Elsewhere in the world..., Uncategorized. You can follow any responses to this entry through the RSS 2.0 feed.You can skip to the end and leave a response. Pinging is currently not allowed. 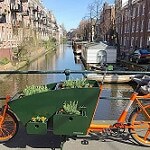 I thought I’d point you to my post about yesterday’s Mama Bakfiets Race (photos and video) Entertaining, to say the least :). Note: when it comes to attacking an obstacle course as fast as possible, the trike is the winner. 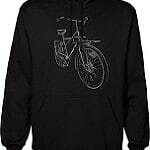 But anyone with a trained eye will see the superior skills of the 2-wheeler bakfiets cyclist, proving your point. Strange and unpleasant how it felt when we tried a Kangaroo. My impression was that as a means of moving kids and cargo about, particularly in a lowish-speed urban environment, it works. 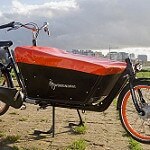 The “box” is pretty, albeit much like the Gazelle Cabby, I’d like to see how it weathers. This respect to the tipping issue, we only tried our two year old in it, and he wasn’t heavy enough for it to be an issue. Still, despite my wife and I being attracted to the look of trikes, we went for a 2-wheeler after trying a couple out simply because we felt the handling of the Kangaroo didn’t offer much in the way of cycling fun. To me, it felt like there was positive feedback in the steering, such that it could jackknife at speed. I did get it up on two wheels (for research purposes, honest), and it could be brought back down quite easily, but there were moments, even at quite low speed, where awkward camber changes made it difficult to keep it on the cyclepath. I posted this on my blog and a long-term Kangaroo-owner pointed out that the steering problems could have been a function of a poorly adjusted steering damper. I don’t know. 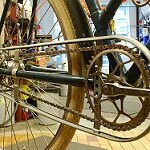 However, it occurs to me that if the pivot could be sufficiently damped and not make it impossible to steer, there may be a sweetspot whereby the damper could stop the possibility of the frame swinging to one side in the event of the trike tipping. What is worth pointing out is that the Kangaroo’s pivot works to cause the frame (and rider) to lean into a turn. I suspect that without damping, this would increase the likelihood that frame would swing to one side, and as you point out, it could be a serious concern if traffic was passing. Just out of curiosity I never heard anything about that event. How did you come across it? One can fiddle for years with the geometry and adjustments of a three-wheeler but in the end it’ll remain a trike. As long as the load is reasonable and the rider is competent cycling on a bicycle (2 wheels thus) is simply more intuitive, pleasant and faster. The resulting vehicle is also narrower, simpler and cheaper (for a given level of quality). 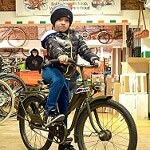 Of course such a special two wheeler must be well designed and constructed, and after a number of years of being spoiled with the excellent Bakfiets Cargobike the copies are adding up quickly. 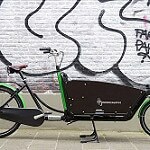 Thus far all of the Cargobike copies have either missed the important parts or just been too cheaply made to work properly. 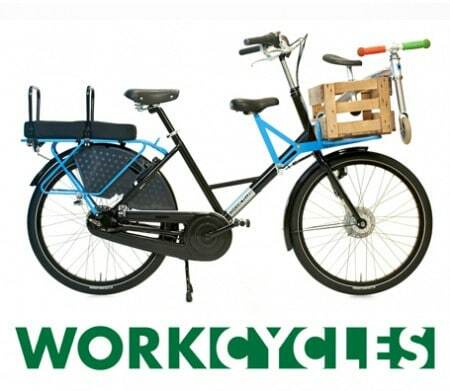 WorkCycles once sold more trikes than bikes for child transport. But once people began to accept the Bakfiets Cargobike and see them on the streets the ratio gradually tipped in favor of the Cargobike. 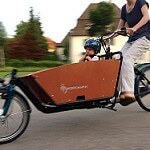 We also saw that our customers were generally happiest with their Cargobikes. They came back for service, new accessories and fresh tires. Their friends and neighbors also came to us to buy more bikes. The trikes we sold were often never seen again or they returned for “non-use” related repairs, sometimes covered in spider webs and with moss in the box. What a shame to spend €2000 on trikes and then not use it regularly. I came across the race through a friend of mine, who mentioned it online (where else). So word of mouth. Didn’t know beforehand it was a sponsored charity event, but that luckily that didn’t ‘spoil’ the fun.